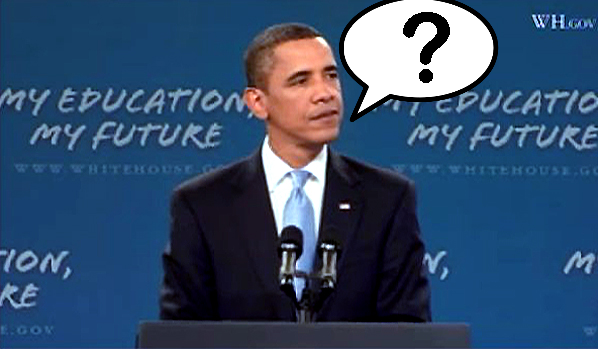 President Obama at James C. Wright Middle School — What Will He Say? I don’t have any inside information about what President Obama will say when he visits James C. Wright Middle School in Madison on Wednesday, November 4, but I do have some thoughts about what he shouldn’t say, what I would like to hear him say and some other things concerning his visit. All indications are that Obama and Secretary of Education are here to push Governor Jim Doyle’s Race to the Top (RttT) lottery ticket purchase plan. This is wrong. If that’s what is going on then Obama and Duncan should be speaking to the legislature and not using the students and staff at Wright as props to lobby for their misguided reform incentive package. I’d like to see the President come to Madison and announce a redirection of national priorities centered on full funding of education. I’d like to see this President reallocate from militarism and Wall Street bailouts to investing directly in preparing the our children to build a better future. If you’d like this too, I hope you can join us in a “Books not Bombs” action to be held outside the school at the intersection of Fish Hatchery and Wingra during the President’s visit, 10:00 AM to 12:00 Noon. Details here. The whole RttT lottery is evidence of how far we are from full funding and making education the priority it should be. The history of underfunded Federal mandates in Special Education, Title I poverty programs and programs for English Language Learners is well known. As Robert Godfrey recently noted on this site, the stimulus package required state funding be only at 2006 levels, resulting in flat or shrinking general education funding levels made up in part by one-time federal dollars and in many places steep property tax hikes. The state stabilization funding was accompanied by welcome new Title I and IDEA money, but this too is a one-time deal and the regular funding levels remain woefully inadequate. States are struggling to limit cuts to levels that won’t be disastrous and have all but lost sight of sustainable full funding. Schools aren’t starving (yet) but they are mighty hungry. Make no mistake that this is cake, a treat, not life-sustaining bread. The amount being discussed for Wisconsin is $80 million and this relative pittance would all be targeted for specific programs and when the $80 million is gone, Wisconsin would be stuck with more things that we can no longer afford. Yet Wisconsin and other states are running toward those hoops Duncan is holding, shouting “how high should we jump,” because they are desperate for any education funding, no matter how small, how misdirected or how ephemeral. As I write this, the Assembly Education Committee is fast tracking the legislation to get Wisconsin through those hoops. Only in times this desperate could the chance at so little leverage so much. I hate to see the staff and students at Wright being used in this cynical game. I’d much rather they heard Obama at his best, inspiring hope and aspirations; speaking of the power and joy of teaching and learning, reminding one and all that our public schools are basic to the promises of equality of opportunity; praising our educators and students for their accomplishments; and most of all congratulating the Wright community for their good work and telling the world in some detail how these things are happening at James C. Wright Middle School, despite the odds. Sadly, I doubt we will get much of this. The Doyle, Duncan, Obama education agenda is tangential, irrelevant or counter to what makes Wright a school we should be proud of. Our older son finished 8th grade at Wright last year and I participated in the School Improvement Process as a “friendly observer” so I write from experience and with Panther Pride. Some background on Wright first. Wright is a small school, with relatively small (if limited in their offerings) classes and a “Social Action” focus. 86% of the students qualify for free or reduced lunches, 39% are classified as English Language Learners; the racial and ethnic demographics are 1% Native American, 38% African American, 37% Hispanic, 12% Asian and 13% White. From the Wisconsin Department of Public Instruction, click for WINSS site. There are still gaps in achievement and the test scores in other subjects are not as strong, but the general picture is of a relatively successful school. In other areas, where data is of even more limited utility, Wright is a very successful school. There is a sense of community and an atmosphere of caring that transcends (but does not obliterate) racial, ethnic and economic differences. The staff function as a professional, collaborative team much of the time. In general there is pride, Panther Pride that encourages all to do their best and encourages all to aspire to do even better. Through the social action focus, Wright seeks to bring this “we can do better” message to the wider community. I can’t write this without once again crediting Principal Nancy Evans and the entire staff for these accomplishments and thanking them for all they do. Reviewing the Doyle, Duncan, Obama agenda, I don’t see much that would help Wright get better and I see some things that will make it harder for Wright to maintain the quality and qualities they have achieved. Due to the cuts in education funding in the recent state budget, Madison — like so many other districts — is looking at a very difficult budget in 2010-11. Doyle, Duncan and Obama aren’t offering any help at all with this. A difficult budget will likely mean that small class sizes, particularly those at Wright where they are below the norm for the district, will be targeted. The support staff at Wright is already minimal, with psychologists, social workers, librarians and others only in the school a day or two or three a week. That too could get worse (see here for a report of what is happening in Minnesota). The demographics of the school highlight the importance of funding for students in poverty and English language Learners. The state of Wisconsin provides no poverty aid beyond the limited SAGE program for the early grades, state reimbursements for English Language Learners as a percentage of costs have been falling for over a decade and the Federal money in both these areas remains small. None of the current proposals from Doyle (or Duncan and Obama) do anything to fix this. Much of the agenda they are pushing has to do with more data and more uses of data. It is hard to be against better assessments, better collection of data and better coordination in the use of data; but most of this is a distraction and is linked in their agenda to misguided noti0ns of national standards and expanded use of flawed test data to make decisions about almost everything, including teacher compensation (Doyle’s legislation on the last, here). One at a time on data issues, mostly in the “for further reading” mode. On National standards, I recommend reading what what Deborah Meir wrote here and checking out what William A. Proefriedt has to say to understand how the standards movement is working to undermine the engaged democratic ideals at the base of Wright’s social action mission. This recent report that the development of standards development is being shaped by profit motives of the participants is also worth a look. On the limits of data and data analysis and their potential for abuse, the recent letter to Secretary Duncan from the Board on Testing and Assessment of the National Research Council is a must read. Linking teacher compensation to test scores is wrong in so many ways. Just three things for now; it prioritizes test scores in selected subjects as the be-all-and-end-all of education, shunting aside all those things Wright that make it not just a “relatively successful school” but a great school; it has great potential to undermine collaboration and professional relationships; and it doesn’t appear to work, even by the crude measures of standardized tests. Duncan, Obama and now Doyle like charter schools and Wright is technically a charter school. Technically is the key word. There is nothing about the governance of Wright that is any different than any other school in Madison. The charter status is a historical artifact. If they want to use Wright to make the case for charter expansion, they picked the wrong example. Expanding charters won’t help Wright and it probably won’t help create more Wrights. While on the topic of charters, it is also worth noting that the pedagogy and curriculum of one of Duncan’s favorite charter groups — KIPP — is the exact opposite of the engaged, questioning, challenging lessons that Wright teaches as the basis for social action. Jim Horn has posted on this aspect of KIPP many times, see here, here and here for examples. A few last words on Mayoral control and some other ways that the Doyle, Duncan, Obama agenda is working against the ideal of an engaged citizenry having a voice in public education, how what they are pushing and how they are pushing it undermines the social action ideas of Reverend James C. Wright and the school that bears his name. Mayoral control and the pending legislation for State Superintendent takeovers of districts “in need of improvement” (no further requirements spelled out. just that the State Superintendent says they need improvement) if implemented will make it more difficult for activists to be involved in their schools. School Board campaigns are local, grassroots efforts. Mayoral and State-wide campaigns are mostly about money and advertising. In the first, candidates meet people and listen. In the latter they craft messages based on polling. These proposals won’t completely shut the public out, but they will mute the voices of the grass roots. The voices of the grass roots have also been muted in the way the RttT legislation is being handled in Wisconsin. Governor Doyle issued general outlines a couple of weeks ago with few of the all-important details. The first batch of legislation was introduced Friday 10/29 and the first hearing was scheduled for today (Monday, 11/2). As of this morning there weren’t even Legislative Fiscal Bureau notes attached. Full floor votes in both houses may be scheduled before the end of next week (the session is scheduled to end Friday, but will likely be extended). This isn’t enough time to analyze, much less organize and mobilize. I’d like to hear President Obama and Governor Doyle explain to the students at Wright how this accelerated schedule serves the democratic process and why it is necessary to make it so difficult for students and others concerned with the future of education in Wisconsin to have their voices heard. This is no more likely than the promise of new priorities and pledge of full educational funding I wished for at the top of this post. So in closing, I’ll express my hope for one thing that I think may actually happen: President Obama, please be sure to spend some time with “Mother” Jacqueline Wright and share some of the stories of Mother and Reverend Wright’s activism with the world. If, as you do this you are reminded of why it is so important that voices from the outside be heard in the halls of power and have some second thoughts about the rest of the agenda for your visit, please heed those thoughts. State Senator Mark Miller (D-Monona) issued a press release today that spells out some very important concerns with Wisconsin’s mad scramble for Race to the Top funds. See the release here. Worth reading and thinking about.